Learn more about these cultures through play is the slogan that the National Autonomous University of Mexico (UNAM) is using, along with its Basque and Catalan lecturers, supported by the Etxepare Basque Institute and the Ramon Llull Institute respectively, to invite everybody this Wednesday, to learn more about these languages and cultures. The activity is free and opened tot he public. 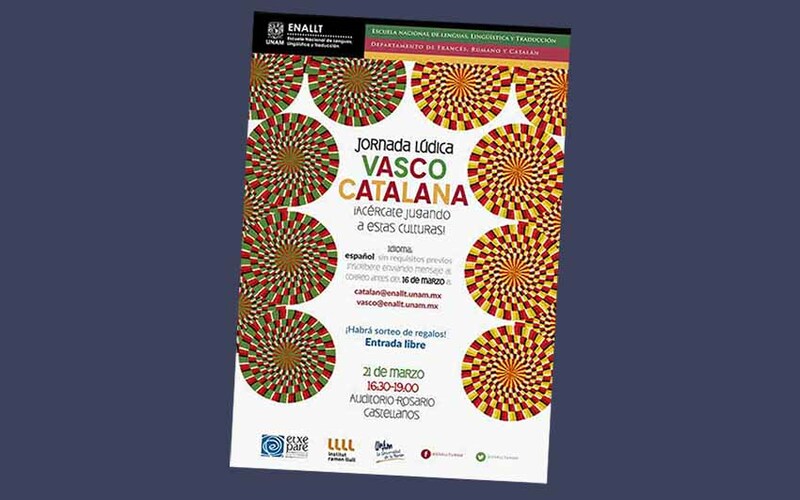 If you are interested in Basque or Catalan, why not check it out? Mexico City, Mexico. No prior knowledge is required, only interest and curiosity in any of these languages and cultures. The event will take place in Spanish. Enrollment is encouraged via email: vasco@enallt.unam.mx or catalan@enallt.unam.mx. The even will consist of, as indicated in its name of a “Leisure day in Basque and Catalan,” where both languages and cultures will be presented through games and leisure activities that will include raffles and prizes. Admission is free. The event will take place on Wednesday, March 21st from 4:30-7:00pm at the Rosario Castellans Auditorium at the UNAM with he support of the National School of Languaes and Translation, the The Etxepare Basque Institute, and the Ramon Llull Institute.